Swiss aviation pioneers Bertrand Piccard and André Borschberg just took an important step toward their 2015 goal of flying around the world on a solar-powered aircraft with the successful maiden flight of the Solar Impulse 2. Professional test pilot Marcus Scherdel took the cockpit of the single-seater aircraft at Payerne Airport in Switzerland and lifted off at approximately 5:36 this morning Central European Time (CET) for a 2 hour and 17 minute flight that climbed to an altitude of 5,500 feet (1,670 meters) before returning to Payerne. “This inaugural flight is an important stage — a step closer towards the round-the-world flight. It is also a huge emotional step for the entire team and all our partners who have worked on the aircraft,” said Borschberg, Solar Impulse co-founder, CEO and pilot. This was the first of several test flights the Solar Impulse 2 team will undertake in the next few months in order for the experimental aircraft to earn certification. Last year the first Solar Impulse successfully flew across the United States from San Francisco to New York City and with their upgraded version, Borschberg and company founder, president and pilot Piccard want to prove that a solar-powered airplane can fly long-range flights both during the day and at night without using fuel and polluting emissions. Solar Impulse 2 is made of carbon fiber with a 72 meter wingspan and a weight of 2,300 Kg. The airplane features 17,000 solar cells on the wings which supply four electric motors with renewable energy from the sun. Night flights are made possible because of lithium ion batteries that are recharged during the day using the solar cells. Solar Impulse isn’t the only company working on fuel-free clean energy aviation. Solar Flight’s Sunseeker Duo is the fastest solar-powered two-seater airplane in the world and is currently testing in Italy with the goal of passenger flights this summer. 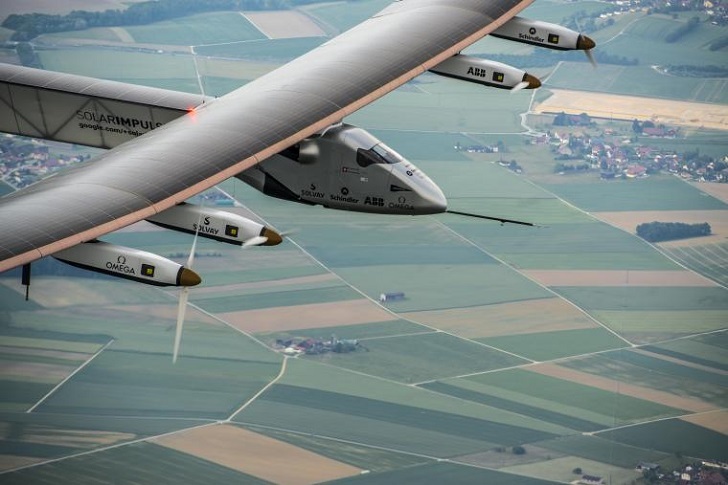 Swiss aviation pioneers Bertrand Piccard and André Borschberg today took an important step toward their goal next year of flying the first solar-powered aircraft around the world with the successful maiden flight of Solar Impulse 2.